Sixteen years ago, you might have looked up at the night sky and expected to observe T Pyxidis shining at a brilliant 7th magnitude - in outburst for the sixth time since 1890. You would have been disappointed though, because there was no outburst that year, or the year after ... or the year after that. In fact, for a recurrent nova with an average of 19 years between outbursts, T Pyxidis is more than fashionably late to the party. This star is way overdue for an outburst and when it happens, some people think it is going to be a big one. It has been 35 years since its last outburst and variable star observers are confident that they have not missed one since that time. They think that during this extended period of quiescence, while the star remained around 14th magnitude, it may have accumulated an extra-thick charge of nuclear fuel on its surface, which will make it extra bright when the nova finally throws the mass of debris and gas into space. The five maxima of the recurrent nova T Pyx from 1890 to 1967. Data from the AAVSO International Database. Click image above to see two more historical light curves of T Pyx. T Pyxidis is one of the few known recurrent nova and presently holds the record for the greatest number of observed outbursts with five recorded to date. The first outburst was detected on May 1902, "discovered" some time later on Harvard photographic plates. The star reached a peak brightness of 7.3 on May 2 and by January of the next year, it had returned to its normal 14th magnitude state. The discovery of the nova stimulated a search of the Harvard plate collection, and as a result, a previous maximum was discovered for T Pyx in the spring of 1890. The next outburst occurred in 1920 followed by another explosion in 1944. The fifth outburst of T Pyx started in 1966 and was discovered by Albert Jones, an AAVSO member and well-known variable star and comet observer of Nelson, New Zealand. Jones had been checking the star field of T Pyx frequently for 12 years, each time finding the star invisible at fainter than visual magnitude 13.5. This was the case on November 12, 1966. But when he next looked, on December 7th, he saw the variable for the first time, at magnitude 12.9, and he immediately notified other observers. Two nights later T Pyx was almost four magnitudes brighter. For the next month, the nova brightened slowly, oscillating sometimes with a period of mere hours, until it attained a maximum magnitude of 6.3 on January 11, 1967. The nova started to fade with marked oscillations and declined in brightness at the rate of .03 magnitudes per day for the first 100 days. The rate then increased to .1 magnitude per day for about 20 days and was followed by a more gradual decline to its minimum state around magnitude 15. That was the last we have seen of T Pyx in outburst, and according to its period interval, it is about sixteen years overdue for another one! Recurrent novae show similarities to both dwarf novae and classical novae and may be the evolutionary link between the two. T Pyxidis belongs to a small and seemingly "exclusive" group of cataclysmic variable stars called recurrent novae (NR) - of which there are currently less than ten confirmed members. This class of stars is comprised of a physical system similar to the nova and dwarf nova type of cataclysmic variables, where a close binary system experiences significant mass-transfer between the primary and the secondary stars. Recurrent novae, however, display outburst properties such that they cannot be categorized into either the dwarf novae or the classical novae groups. While classical novae are classified as stars that undergo one outburst (8-15 magnitudes) with a quick rise to maximum, later to slowly decrease to pre-outburst amplitude, and dwarf novae are known for their frequent (10-1000 day), moderate-amplitude (2-6 magnitudes) outbursts, recurrent novae seem to exhibit characteristics somewhere in between the two. They typically vary by 4-9 magnitudes, on a 10-100 year period. According to Webbink et. al (1987), recurrent novae are defined by two criteria. First they must have two or more distinct recorded outbursts, reaching an absolute or apparent magnitude comparable to that of classical novae ( i.e., Mv <~ - 5.5), and second there should be the ejection of a discrete shell in outburst, at velocities comparable to that of classical novae (vexp >~ 300 km s-1). What causes the recurrent outbursts seen in these novae? Is it similar to the mechanism that drives classical novae? Dwarf novae? Both? As is often the case, the answer lies somewhere in the middle, a combination of the two types of CVs. It used to be thought that a common mechanism was involved for each type of cataclysmic variable phenomenon. It is now understood that while some of the basic characteristics are similar, the outburst mechanisms among CVs differ quite significantly. Dwarf novae stars can best be understood in terms of accretion-powered events with outbursts being caused by instabilities in the disk (disk instability model) or an increase in the mass-transfer rate (mass transfer burst model). In contrast, classical novae erupt when the white dwarf star has siphoned enough hydrogen off a companion star to trigger a thermonuclear runaway. As hydrogen builds up on the surface of the white dwarf, it becomes hotter and denser until it detonates like a colossal hydrogen bomb, leading to a million-fold increase in brightness in one day. A nova quickly begins to fade in several days or weeks as the hydrogen is exhausted and blown into space. Recurrent novae, which may be a connecting link between dwarf novae and classical novae, show outburst mechanisms similar to both of the aforementioned cataclysmic variables. Webbink et. al. (1987) propose that there are two types of recurrent novae can be distinguished based on the two distinct types of outburst mechanisms observed. Recurrent Novae, type A (NRA): outbursts are a result of thermonuclear runaway on the white dwarf. T Pyx is an example of such a system. Recurrent Novae, type B (NRB): eruptions are driven by the accretion from a red giant on to the companion star. In such events, the outbursts may be generated by an instability in the cool companion or by a disk instability. T CrB, RS Oph, and V745 Sco are examples of this type. Although several other recurrent novae are known, T Pyxidis displays several unique features, which distinguish it from the others. The light curve is that of a slow nova; at each outburst the star faded at the leisurely rate of about one magnitude per month, and also showed considerable oscillations when near maximum. In contrast, the typical recurrent novae T Coronae, RS Ophiuchi, and U Scorpii have all shown extremely sudden outbursts with sharp maxima and very rapid fading. T Pyxidis also has the shortest average interval between maxima. While most novae spend 10,000 to 100,000 years collecting enough hydrogen from their companions to ignite an explosion, T Pyx erupts several times a century. This nova's fondness for outbursts, astronomers believe, is because its underlying star is about as massive as a white dwarf can get. If it were any more massive, the star would collapse under its own gravity and form what is called a neutron star. As it is, T Pyx only needs to drain one part in ten million of its companion's hydrogen (roughly the mass of the Moon) to start an eruption. This can be done in a matter of decades leading to the fascinating structure that HST has recently revealed (STScI, 1997). Click image to enlarge. This high resolution image of T Pyx by HST shows that the shells are actually more than 2,000 gaseous blobs packed into an area that is 1 light-year across. The blobs may have been produced by the nova explosion, the subsequent expansion of gaseous debris, or collisions between fast-moving and slow-moving gas from several eruptions. Images from ground-based telescopes have shown a smooth shell of gas surrounding T Pyxidis. But closer inspection by the Hubble Space telescope reveals that the shell is not smooth at all, but a collection of more than 2,000 gaseous blobs packed into an area that is one light-year across. 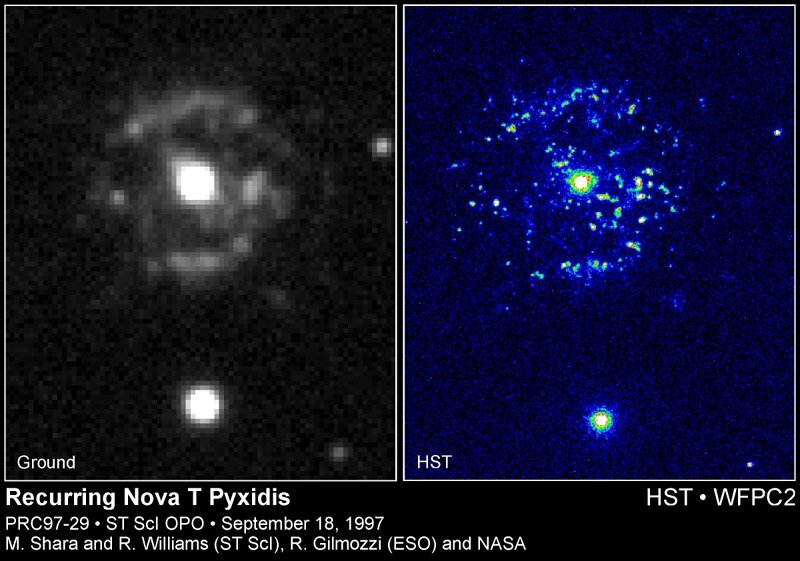 Astronomers acquired this new information by focusing the Hubble telescope's cameras on T Pyxidis. The blobs may have been produced by the nova explosion, the subsequent expansion of gaseous debris, or collisions between fast- and slow-moving gas from several eruptions. "Based on these observations, our previously standard view of what nova shells should look like may be fundamentally wrong," says Michael M. Shara, now at the American Museum of Natural History in New York, "The view is that a nova explosion is the same in all directions, with debris traveling at the same speed, so that a fairly smooth cloud is formed. Instead, we've found this myriad of individual knots [blobs]. This observation suggests that shells of other novae do the same thing, as recently ejected material plows into older, fossil material from previous explosions." Ground-based and Hubble telescope observations have allowed Shara to reconstruct a sequence of a T Pyxidis blast. When the nova erupts, it flings waves of gaseous material at progressively slower speeds: the first wave of hot gas flies through space at 4.5 to 6.7 million mph (2,000 to 3,000 kilometers per second), the last at 446,000 to 670,000 mph (200 to 300 kilometers per second). About a few weeks after this eruption, the first waves of speedy debris collide with slow-moving fossil material from the previous outburst, possible forming the gaseous blobs. Shara observed, for example, fast-moving gas from the 1966 eruption plowing into slow-moving material from the 1944 detonation. As the speedy, newly ejected material slams into the older, plodding debris, it heats up, glows brilliantly, and slows almost to a halt. Eventually the bright material fades as it cools down. The blobs are distributed in eight concentric circles around the exploding star, producing a pattern similar to tree rings. Just as tree rings furnish scientists with information about a tree's life, so the circle of debris around T Pyxidis provides astronomers with a history of this prolific nova. Do You Want to Catch T Pyx in Outburst? T Pyxidis is located in the southern constellation Pyxis (the compass of the ship Argo). Click on the image to see how you can locate T in the constellation. 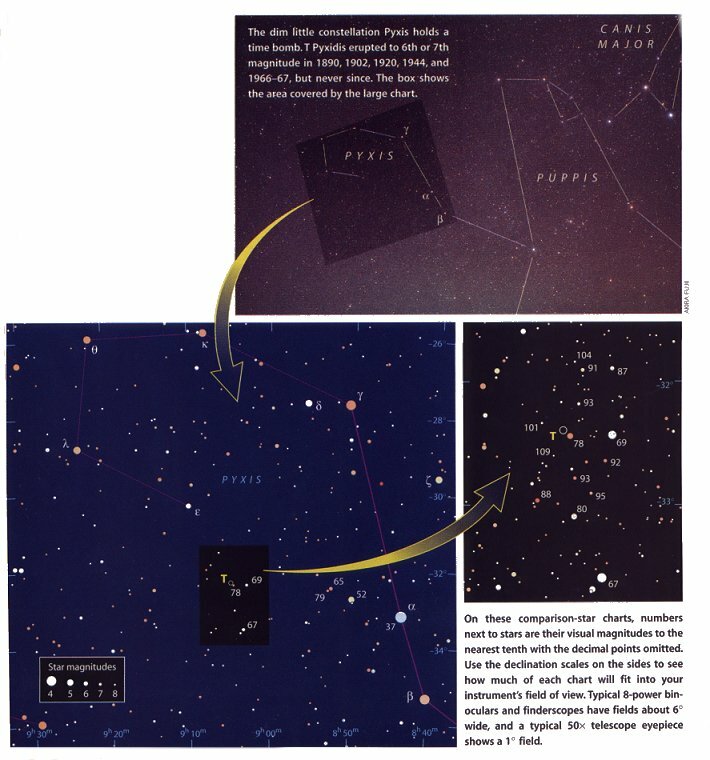 Credit: Sky and Telescope, April 2002, p.93. T Pyxidis lies 6,000 light years away in the dim southern constellation Pyxis, the Mariner's Compass. At declination -32 degrees, T Pyx is most easily observable from the Southern Hemisphere and the tropics. T reaches a maximum altitude of 18 degrees as seen from 40 degrees north latitude. In early February it is highest around midnight; by early April it transits at the end of evening twilight. Pyxis forms the fourth corner of a rectangle with Alphard, Procyon, and Sirius. T lies 24 degrees almost due south of Alphard. Finding its exact location may take a while the first few times but once you learn the area, you'll be able to check the spot with binoculars or a telescope quickly and easily. Observers are cautioned to be certain of their identification of T Pyx, as there are several other variables in the field. AAVSO star charts are available to help you locate T Pyx. If you happen to catch this recurrent nova going into outburst, please contact the AAVSO as soon as possible so we can alert others observers to this spectacular event. With a little patience and some perseverance, you just might be the first to catch the next eruption ... good luck! Burnham, Robert. Burnham's Celestial Handbook, 3, 1521, New York, 1978. Knigge, C., A.R. King, and J. Patterson. "Assisted stellar suicide: the wind-driven evolution of the recurrent T Pyxidis", Astronomy and Astrophysics, 364, L75-L79, 2000. MacRobert, Alan M. "T Pyxidis: Still Hanging Fire", Sky and Telescope, April 2002, p. 93. Patterson, J.; Kemp, J.; Shambrook, A. et al. "Two Galactic Supersoft X-Ray Binaries: V Sagittae and T Pyxidis", Publications of the Astronomical Society of the Pacific, 110, 380-395, April 1998. Shara, Michael M., David R. Zurek, and Robert E. Williams. "HST imagery of the non-expanding, clumped 'shell' of the recurrent nova T Pyxidis", 114, 1, p.258, 1997. STScI Press Release. "Blobs in Space: The Legacy of a Nova", September 8, 1997. Webbink, Ronald F., Mario Livio, and James W. Truran and Marina Orio. 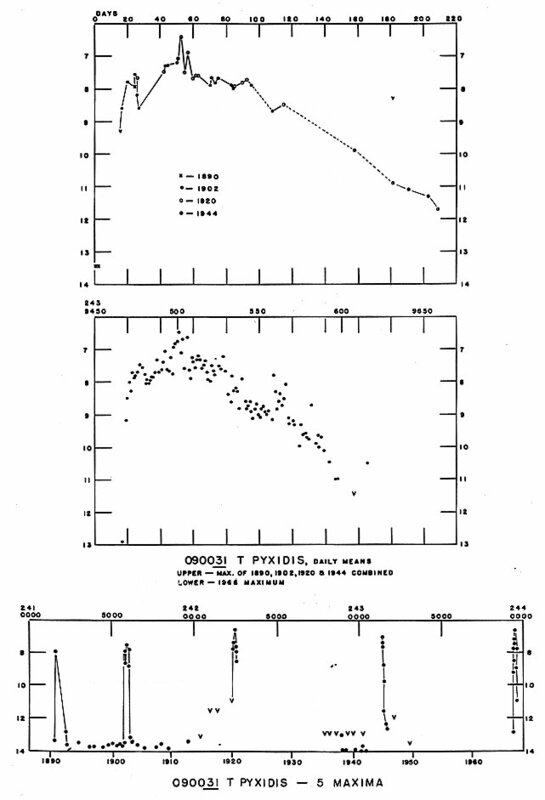 "The Nature of Recurrent Novae", The Astrophysical Journal, 314, 653-672, March 15, 1987.